A while back I posted about Too Much Yarn. So now it is time for an update. Soon after I made that post, I saw in our church program that they were asking for help with knitting/crocheting for the babies in the Koutiala Hospital as a part of the Mali Project. The idea is that every baby born at the Koutiala Hospital goes home with an outfit and light blanket. So I thought I would give the contact person a call, as I had all this yarn just waiting to be used, and most of it baby stuff! I wanted to give it to her to give to the people who were knitting. Well, she was less enthused, apparently she needs the knitting, but she said she would ask around and she took my name and number. I never heard back from her. Now, I am always knitting, every spare moment. I can barely sit down without picking up the needles. I have projects specifically that I do during work breaks, simple things which I can chat with the gals while knitting. I usually have 2 or 3 projects going at home. And yet, I complain that I don’t have time to charity knit! What is that all about? So I thought, after I complete my current work project, I will use my work time to charity knit. In fact, I have a pretty decent stash of unused baby hats and sweaters to start me out. Now, my coworkers also know how to knit, so I thought maybe I would try to get one of them in on the action, providing that I donated the yarn and needles. I got a tentative yes from my favorite coworker. (She needs a nickname for this blog since I talk about her enough, and she reads this, so it has to be something good 😉 ) So, expect to start seeing some charity knitting here in the near future, projects by the 2 of us! Also, if anyone knows of any simple and free baby patterns, please feel free to share! This past weekend, my daughter went to spend a bit of time with her father. He called me at one point because he said he had a very funny story to tell me. He said that he looked at her mouth and tongue and they were a terrible shade of green. So of course, he was concerned about what she might have put in her mouth or that something was terribly wrong. He went to his mother and asked what she might have fed my daughter. She said nothing but Cheetos. But there was no sign of the orange cheetos , just green. So he became more concerned, until he looked at his mothers mouth, which was also green. They then decided to consult the Cheetos bag, which said “turns your mouth green like Shrek” So his fears were abated and his desire to call poison control quelled. They had a good laugh over the incident, as did I. Well she came home that night, and I am telling you, that child had the worst case of adult sized gas I have ever heard! The next morning, same thing. So I emailed her father and asked what the heck he had been feeding her that she would end up with this issue! He emailed back a list of foods that she ate, and added that she had of course also had the cheetos that turn your mouth green, and he wondered if that could have been the problem. I said, perhaps it was. I quickly got an email back saying “Yeah, turns your mouth green like Shrek, and makes you fart like Shrek” and I tell you, crude as it was, I laughed so hard I snorted and had tears running down my face! 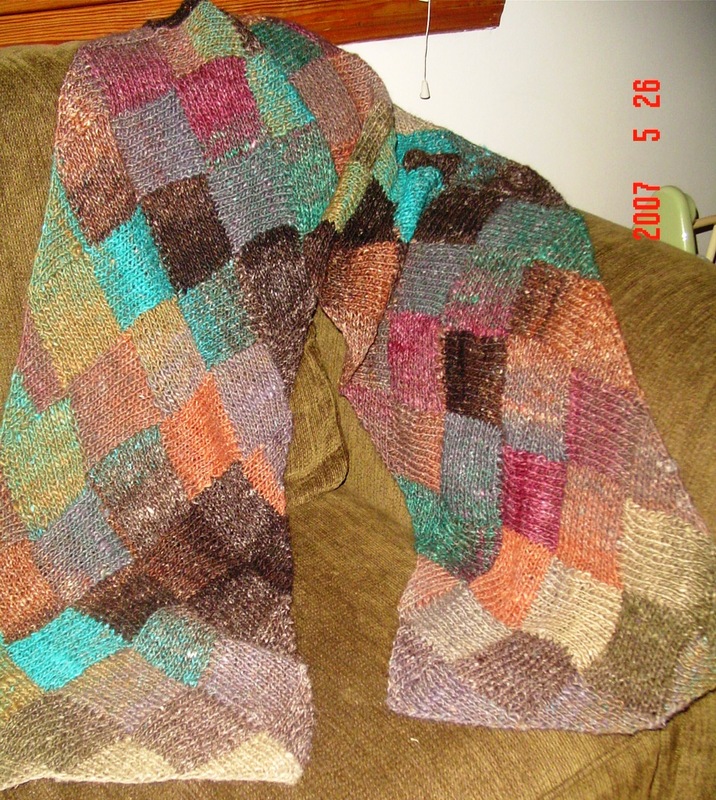 The promised picture of the scarf. 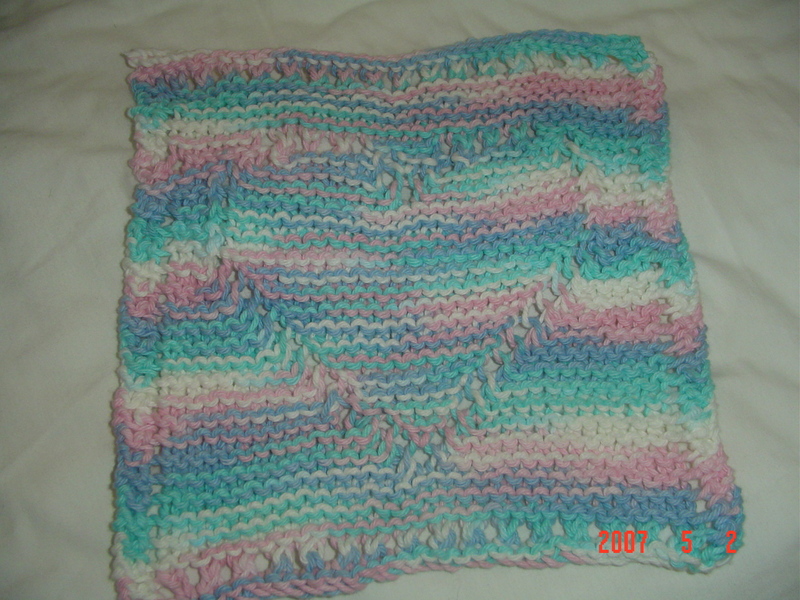 Blocking made this beautiful! Last time I was in the local craft store to pick up supplies, I saw a fairly inexpensive tub of plastic beads. There were all sorts of animals and the holes in the beads were large so I thought they would be perfect for my daughter to string with a plastic tapestry needle onto yarn. I was not mistaken, she spend an entire afternoon beading! Is done! It is stunning. I blocked it 2 nights ago and last night my daughter had a blast taking all the pins out and putting them away. In fact, once she took them all out, she wanted to put them all in again. I guess she won’t have to learn the hard lesson that blocking makes everything better! (It would be my wildest dream that she might learn to knit but if she takes after me, she will learn to sew with her Nana instead). I will get a picture of the scarf posted soon. I had to bring it in to work to show it off. 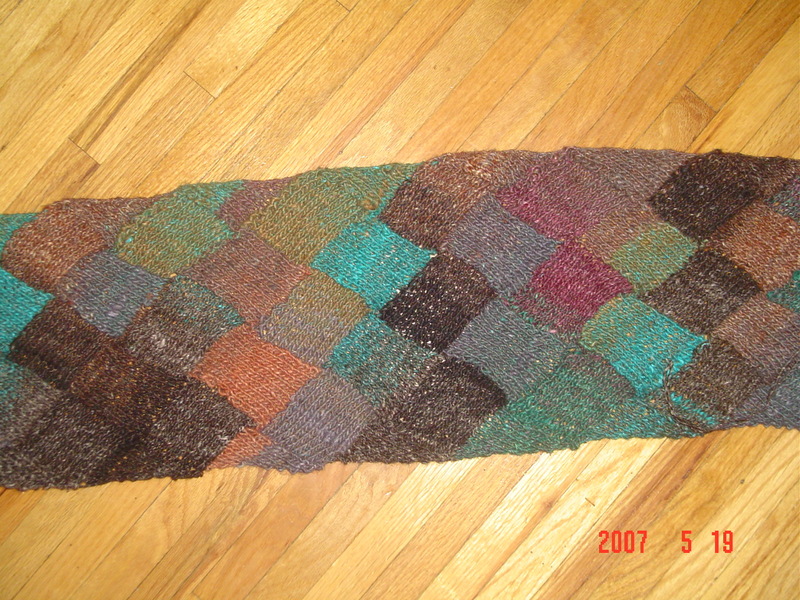 I enjoyed knitting it so much and the colorways were so fun that I could turn around and do it all over again. I thought, who can I make a scarf for? My brother came to mind but do we all remember what happened with the hat? (He didn’t want it!) This time I will ask before I start! Maybe my mom would like one, I could match it to the felted hat that my aunt made her a couple years ago. Hmmm…that doesn’t sound bad either! Well, I am positive that my favorite coworker takes the best pictures ever! She promised me a picture of the shopping bag I made for her in use. Check it out! I swear that it looks better in her photo than it does in real life! 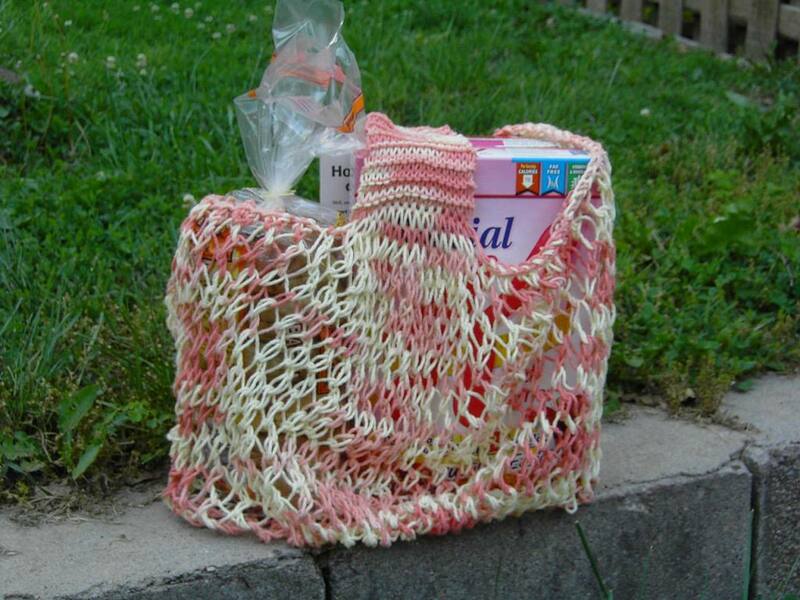 The pattern is Turkish stitch string bag with a few modifications. 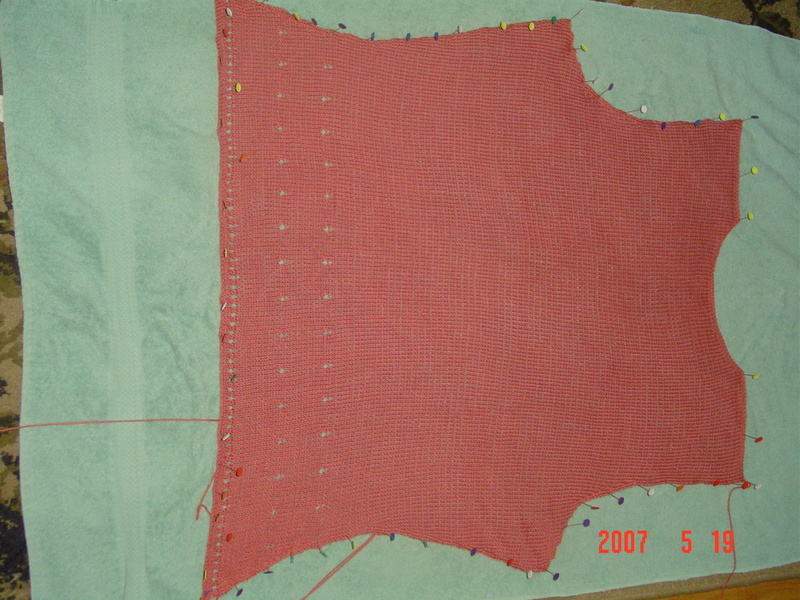 I used US size 17 needles for the bottom and sides of the bag. I did not do a full 12 inches on the sides. 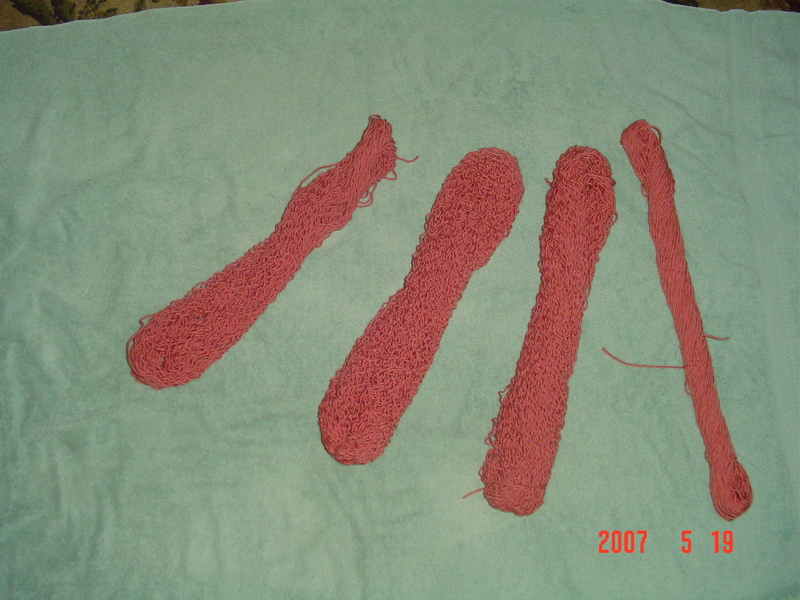 I then used US size 10 needles for the handle and made the handle quite short compared to the suggested size on the pattern. I knitted it at work on breaks with said coworker which meant that she got to have input that shaped the outcome of the bag. This was great since I have a tendency to blindly follow a pattern, not being confident that my modifications would be any good at all. Why is it that knitting for someone is so much more inspiring than knitting for myself??? Of knitting, blocking, and frogging. 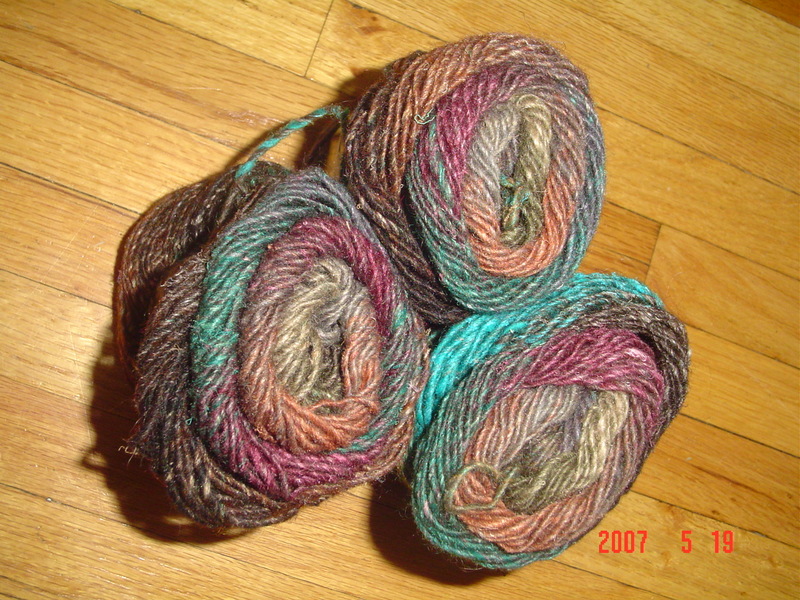 It has been awhile since I have made a true knitting post with pictures. That doesn’t mean knitting hasn’t been done. Just means that I would rather knit than post about it at the moment! And also a cloth bag for my coworker who doesn’t like to use the plastic grocery bags. She already has it but will take pictures of it in use for me to post. Yes, I am redoing it. I love the sweater and I am determined to make something for me that looks good. It is all about the process…not the failures. Isn’t that stunning? I love it! I can’t stop knitting it! It is too much fun and way easier than I supposed.